The publishing extension is able to upload to the server any project generated in local. Visually, the menu is very similar to the publishing tool, except for the fact that all that refers to the generation of the project have disappeared, because it will not generate the definition of any other service, only it will upload an already existing one. Therefore, we need to indicate the local project folder which we want to upload to the server and set the connection parameters. This process of publishing the project generated on the server can be done automatically at the time the project is created, or can be upload after with another tool extension. 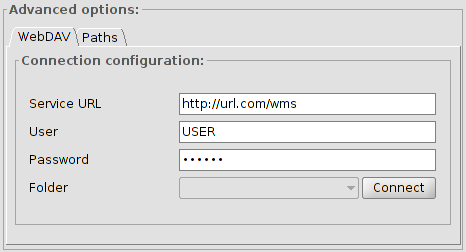 In the first case (automatically), you need to indicate the destination address to establish the WebDAV connection. If it is a directory authentication, you must also provide the username and password. With all the information provided, the ‘Connect‘ button will check that connection and also it will fill the left menu with the subfolders that exist in the specified path. 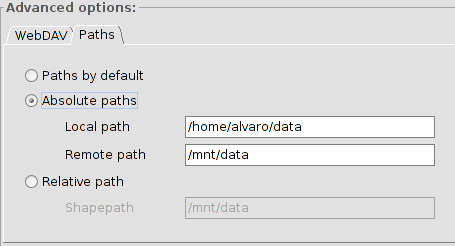 Default paths: This option does not alter the paths to resources, setting them such in the definition files of the different services..
Absolute paths: adequate if there is a correspondence between the location of the files on both machines (eg, the shapes are inside a folder called ‘data‘ and have identical directory structure inside), but the access to that folder has different routes on each machine (for instance, local directory is ‘/home/user/data‘ and the server is in ‘/mnt/data‘). This option will replace in the configuration, the access paths to the local machine for the server ones. Relative paths: taking as origin the service configuration file (the mapfile if it is MapServer), you can set a route to resources from it using a ShapePath variable. From that file and adding the indicated for the ShapePath variable, the rest of the resources accesses will be built. With this post, we finish with the series dedicated to the publishing extension (view 1 and 2),first add-on released on “On the road to gvSIG 2.2”. This entry was posted in english, gvSIG Desktop, gvSIG development, testing and tagged gvSIG 2.2, mapserver, publishing. Bookmark the permalink.